This is such a cute card but probably the simplest I've ever created. We made this card at my friend's workshop, fellow demonstrator, this past weekend (again, she prefers not to be mentioned). I love her designs and wanted to share them with you. This card again is simple but cute, however you can modify and embellish it however you desire. 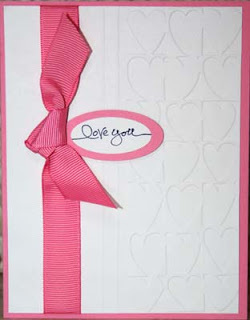 I may alter this card by adding some hearts in Pretty in Pink before embossing the hearts with the Cuttlebug. Use the Cuttlebug for embossed hearts on the right. Then score the paper and then again 1/4 or 1/2 inch away. Tie ribbon in knot on the left side. Use oval punches to cut out cardstock. Adhere ovals to card (with Dimensionals).